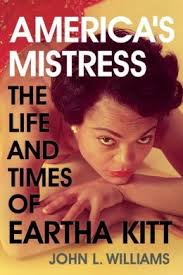 America's Mistress- The Life and Times of Eartha Kitt by John L. Williams is a 2012 Quercus publishing release. Just like the author states at the beginning of the book, most people of a certain age only recognize Eartha Kitt as one of several women who portrayed Catwoman on the old Batman television series during the 1960's. The author's primary focus is on Eartha's career prior to the Batman series and this I believe was done to demonstrate Eartha's illustrious career and remind people she was much, much more than the Catwoman character she came to personify. I for one did fall into the category the author knew most people fell into. I had a vague inkling that Eartha was a singer and dancer and had other roles on film, but I couldn't have told you what songs she sang or movies she appeared in. I had no idea what her personal life was like, if she had ever married or had children. So, I found all the facts and stories told in this book utterly fascinating. Eartha's beginnings were humble. Her parentage, though the records are rather vague, suggesting she is of mixed race. Eartha was shuffled around a great deal and her childhood was far from being charmed. But, she did catch a few breaks here and there and her drive and determination to have a better life is what gave her a distinct advantage over many black women of her era. Eartha was taught different languages and not only spoke them fluently, but sang in different languages as well. She was not afraid to use her sexuality and she made no attempt to hide ambitions. She was well traveled, loving some places and not others. She has many lovers , some of which were famous and white which was very taboo in those days, but Eartha's popularity was not affected by those relationships mainly because she was very tight lipped and did not brag or gossip about her lovers. Privately, however, she did suffer the same pain as anyone who is a victim of racism. While her wealthy white lovers were all too happy to date her and some were no doubt in love with her, they didn't have the guts to go all the way in and marry her, too afraid of the backlash and stigma. Over the years, Eartha did not seem to fit into any specific mold, often criticized for not being more vocal on the civil rights front. Once she did got on a diatribe it was perhaps not the best time and it came back to bite her big time. Her career took a downturn shortly thereafter and from then on she kept a low profile often living overseas. I had no idea about this part of Eartha's life so it made for some very interesting reading. She was certainly unique, one of kind and a very talented. She lead a most unusual life and a full life. Love seemed to elude her in the end, but she did have daughter who became the love of her life. Overall, this book does a lot to show Eartha was much more than people remember her for and it's high time someone reminded us of this. John L. Williams was born, lives and works in his hometown of Cardiff. He writes novels, short stories and screenplays set in a Cardiff that is changing fast. Williams celebrates the lives lived beneath the radar, the hustlers and grifters, hookers and guitar players, drug dealers and shoplifters, looking to make a crust or catch a break, looking for love. They are crime novels turned inside out. The police tried (unsuccessfully) to ban his Bloody Valentine (Harper Collins, 1994). John has also published a number of non-fiction titles including his biographies of Black Power leader Michael X and Shirley Bassey. He currently writes for the Mail on Sunday and the Independent and is co-organiser of the Laugharne Festival. John has also worked for the NME and The Sunday Times, and has been a contributing editor of GQ magazine.